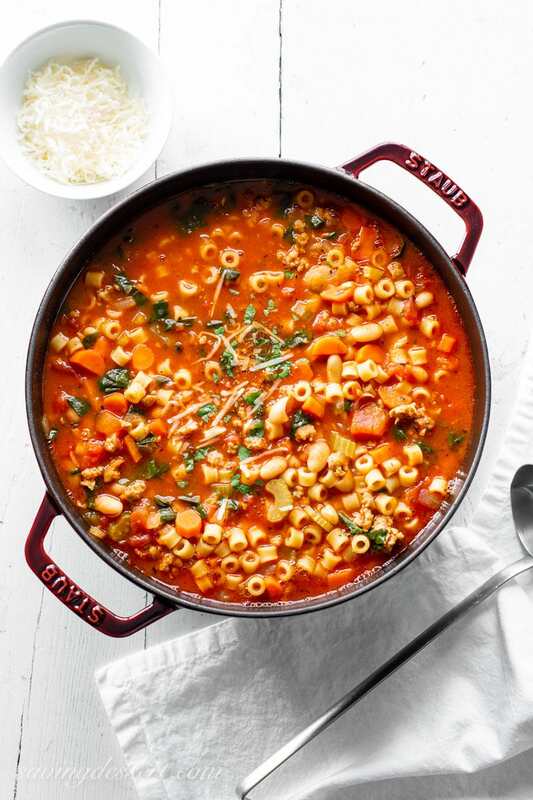 Pasta e Fagioli is a deliciously hearty, stew-like soup loaded with pasta, beans and Italian sausage. Every bite is rich with flavor and plenty of vegetables. This soup is so hearty you won’t need a salad or other tagalong side dishes to complete the meal. 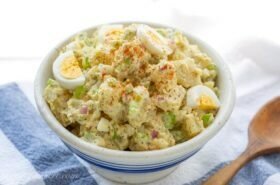 It’s filling, comforting and just so darn good. The Italian sausage adds so much flavor and the heart healthy beans give it a nice textural contrast. You can use any kind of small pasta for this soup, but we prefer for the more traditional ditalini for it’s tiny tubular shape. The process for making Pasta e Fagioli soup is an easy one, with most of the prep time used to chop vegetables. The Italian sausage is removed from its casings and broken into pieces while cooked until lightly browned. Add in all the vegetables and cook until softened. Next you stir in the garlic and seasonings and then add the tomatoes, Parmesan rind, beans and a little broth. Once everything is cooked the pasta is added and cooked until just tender. Aside from prepping the vegetables, this easy soup takes about 30 minutes to get on the table. If you want to freeze the soup, or store for more than one or two days, you may want to omit the pasta until warming to serve. Don’t forget to garnish with plenty of fresh chopped parsley and lots of Parmesan cheese. This soup is also pretty great with an extra drizzle of olive oil just before serving. If you prefer a brothier soup, add an extra cup of chicken broth to the pot or reduce the amount of pasta and Italian sausage added. I don’t think you can mess this up so feel free to make it your own. I use a sweet variety of Italian sausage but hot Italian will be great too. There’s good reason this soup is so popular and beloved. 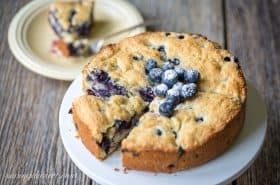 It’s delicious, easy and satisfying! Kitchen Essentials – the BEST Soup Pot! The Staub Cast Iron 3.75-quart Essential French Oven is versatile for everything from a whole chicken to a pot of soup. The enameled cast iron is easy to clean and doesn’t require seasoning. The textured black matte enamel interior ensures exceptional browning and it’s oven safe up to 500F. 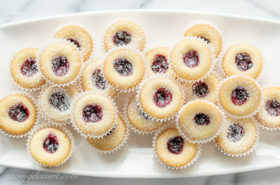 Watch for sales on this kitchen essential on Amazon and Williams Sonoma. 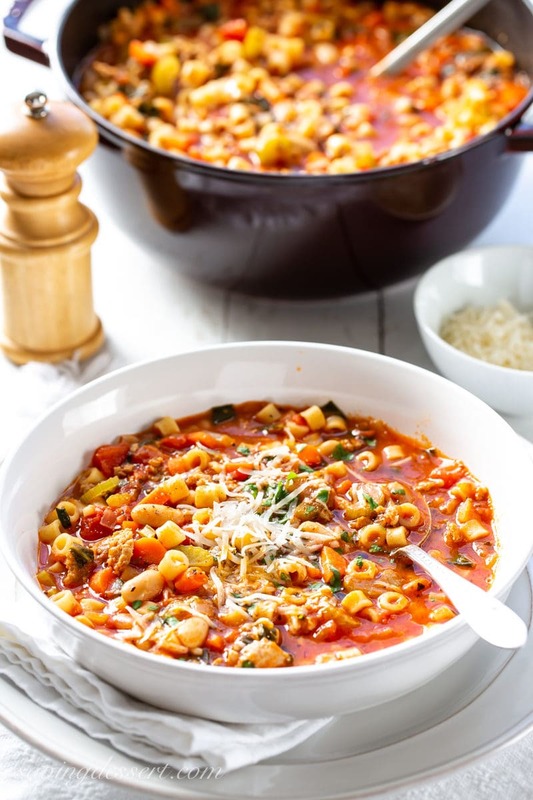 A delicious pasta, bean and sausage soup with plenty of flavor with an Italian flare! Heat olive oil in a large Dutch oven over medium until shimmering. Add the sausage and cook, breaking the sausage into chunks. Cook until lightly browned, about 5 minutes. Add the carrots, celery and onion. Cook, stirring occasionally until the vegetables are softened, about 5 minutes. Add the garlic, salt, Italian seasoning, oregano and red pepper flakes. Cook, stirring constantly until fragrant, about 1 minute. Add the tomatoes and stir to combine. Add the Parmesan rind, beans and 1 cup of the broth. Bring the mixture to a boil, reduce the heat to low and simmer for 10 minutes. Add the remaining chicken broth and 1 cup of water. Increase the heat to medium-high and bring the soup to a boil. Add the pasta and cook until just tender, about 10 minutes, stirring frequently. Discard the cheese rind. Turn off the heat, add the spinach to the pot and stir until wilted. Check seasoning and add salt and pepper to taste. Ladle soup into individual bowls and garnish with parsley, grated Parmesan and a drizzle of olive oil if desired. For a brothier soup, add more chicken broth or use less sausage and pasta. If you’re looking for a few more delicious vegetable loaded soups to try this season, don’t miss our comforting, filling and delicious Hearty Beef and Gnocchi Soup. Our chunky soup is worthy of an entire meal, especially when served with a hunk of crusty bread to sop up all the delicious broth! Click HERE to get the recipe for Hearty Beef and Gnocchi Soup. 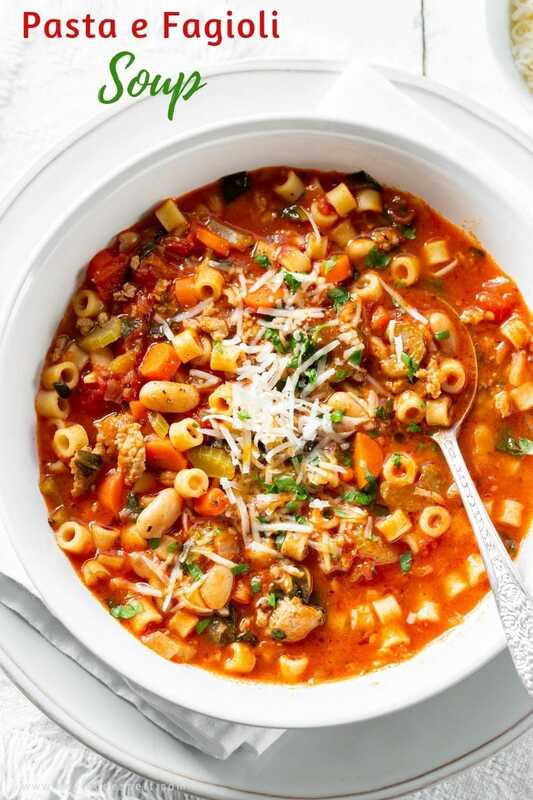 For another Italian favorite, be sure to try our classic Minestrone Soup. 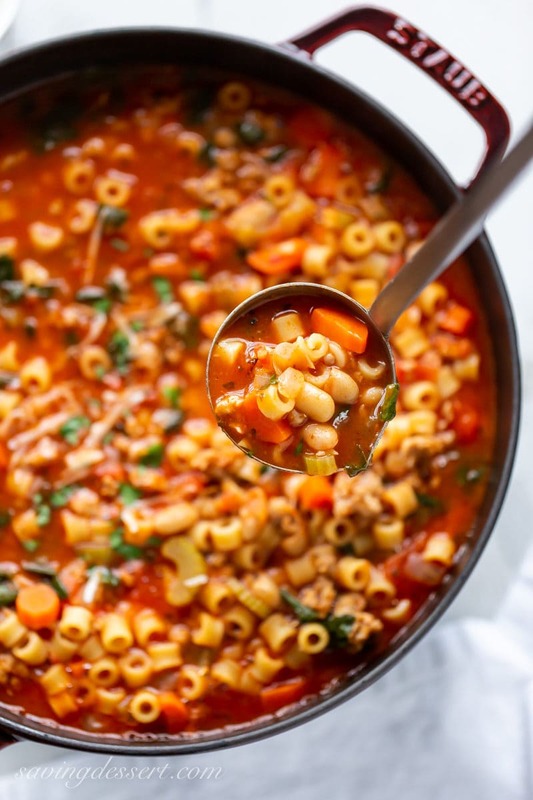 Our Minestrone Soup is full of healthy legumes, green leafy vegetables, plenty of Italian herbs, a handful of pasta, and wonderfully rich tomatoey broth. 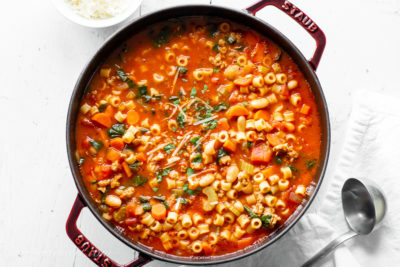 Click HERE to get the recipe for Minestrone Soup. 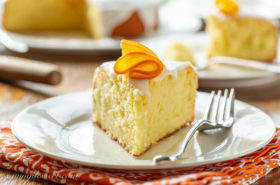 Oh, how yummy, especially delicious on this snowy day! And I have all these ingredients in the house—that never happens!!! It’s cold here again Liz – we need a big pot of this delicious soup! This is beautiful. They’re not all this pretty! I love the pasta shape you picked as well. Adorable. Your comments always make me so happy Susan – thanks so much! Cold in LA? 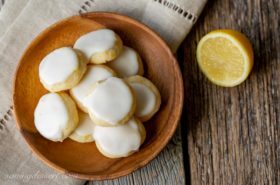 Wow – hope all your lemon trees will be okay! Looks delicious Tricia and I like that it is a one pot meal. Thanks Larry – me too! We really love it Angie – so hearty and fresh tasting and cheesy garlic bread would be great too!